Hi all and welcome to the MFT Who's That Girl Hop! If you happened upon the blog hop and would like to start at the beginning, click HERE to be re-directed to Kim's blog. You don't want to miss any of the eye candy tonight, now do you? Tonight, we are featuring Chick Flick, which is the "headliner" of the brand new VIP collection available TODAY ONLY! This set is being offered THREE WEEKS EARLY as part of the kit and will be "fully" released on January 6th. There are ONLY 50 available and once they sell out, you'll have to wait until January 6th to get your set, so QUICK... click HERE to grab your VIP kit! Get EVERYTHING listed above, for only $34.50! I was SO excited to stamp with this set. I love movies, I love popcorn, I love candy, I love soda... what more could I ask for? I started by stamping my image in Memento black and coloring with Copic markers. I decided to paper piece the couch using some SU patterned paper I had. There were a couple small pieces, but it was reasonably easy to do. 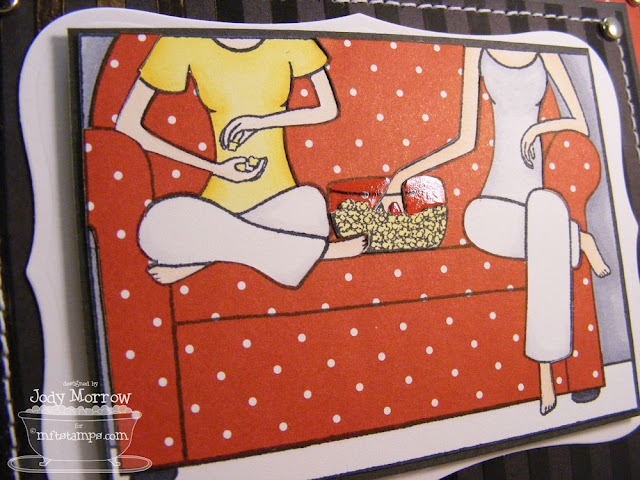 After paper piecing, I stamped, colored and cut out only the popcorn and adhered that OVER my couch paper piecing. I decided to make my bowl GLASS, so after the paper piecing was in place, I went over the bowl with a Sakura Glaze Pen to give it the shine I needed, which distinguished it from the couch. I even finished off the inside of the card with some cute accessory images that come in the set. 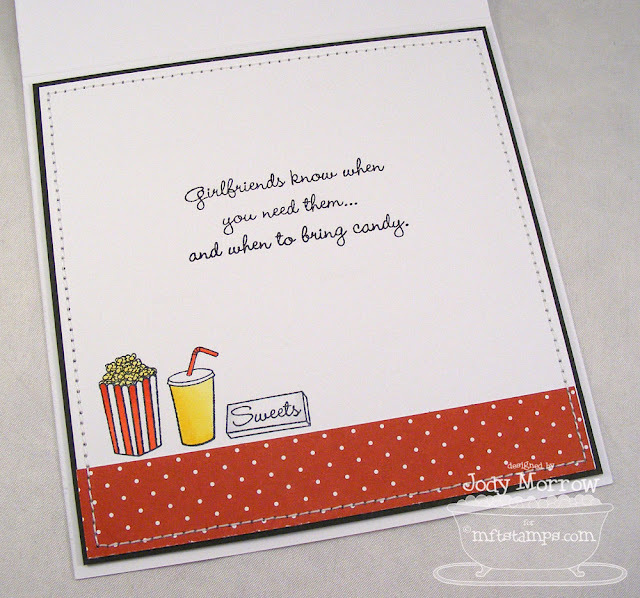 As I was working on my card, I decided I was going to make some fun things to go with it and asked my hubby to run to the store to get me some "movie candy"... you know... the overpriced stuff that comes in a box, but has LESS candy in it that "normally" packaged candy? LOL Thankfully, he was able to get it at Walmart for $1, instead of at the movies for $3. As I was rambling off my list to him, he suggested that if the set was called Chick Flick, I should definitely include some Kleenex in my gift set. I love that man. SO clever! :) I guess you now know that I cry during movies. Confession: I am a sappy girl. I didn't just want to throw some Kleenex in, so I decided to make a Kleenex sleeve instead. If your mini Kleenex pack is too big for these measurements (mine was a tight fit), use the following dimensions instead: cut card stock to 4 1/4 X 7 1/2 and score at 1, 3 1/4, 4 1/4, 6 1/2. If I was making this again, I would use these dimensions. 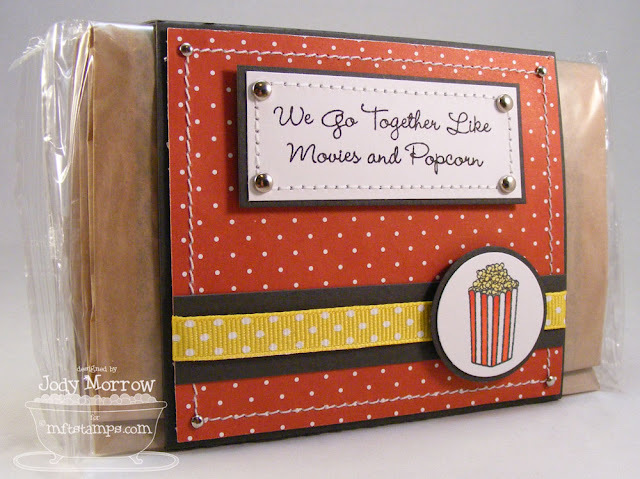 No chick flick is complete without popcorn, so I made a popcorn sleeve that holds 2 standard-sized microwave popcorn packages. Isn't the sentiment adorable? I just love it. If for any reason, your popcorn bags don't fit using the dimensions above, simply adjust the score lines/paper length as needed. Question of the day: Since we are on the subject of chick flicks, I MUST ask you... What is YOUR favorite chick flick? You know... so quirky it makes you laugh... so sad it makes you cry... so sweet it makes your teeth hurt... LOL You can list one or more if you can't decide upon one favorite! Fabulous creations. As for chick flicks .... I like the golden oldies ... guess I am showing my age .... but I am NOT THAT old hehe! Another awesome gift set Jody. As for chick flicks, sorry, I don't have a fav. I know, I'm weird. I'm more into the sci fi stuff. Awesome gift set!!! Love what you've done w/ it! I'm SO buying it! Hmm, as for favorite movies, I'll have to say the Proposal is my newest fav, w/ Hitch, While You Were Sleeping, The Princess Bride, & Two Weeks Notice! Amazing set Jody! Who wouldn't love to get this! 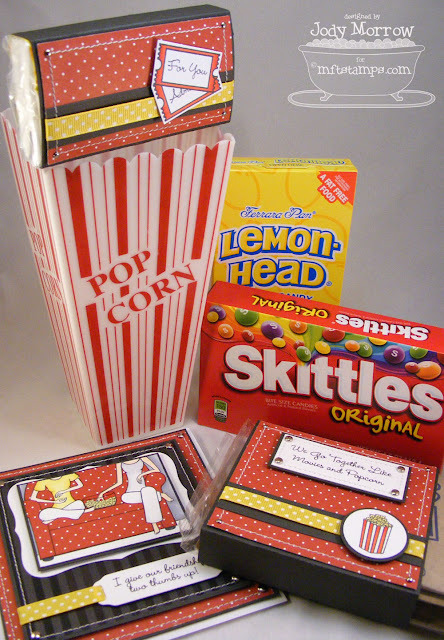 I need to get some of those popcorn boxes! what a great gift set. As for the true chick flick category I would say my favourites are Everafter with Drew Barrymore, Sleepless in Seatle, You've Got Mail, and Never Been Kissed. Fabulous! Love everything you've done with this set! My favourite chick flick is probably The Notebook! 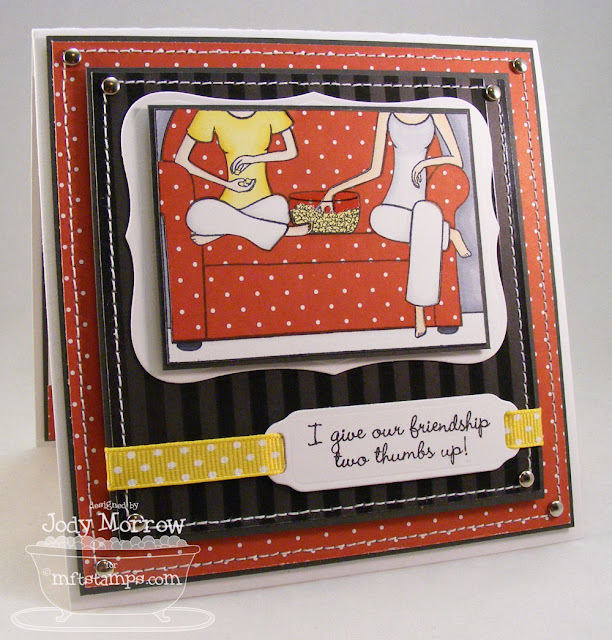 Love your projects Jody!!! AS for a chick flick...I'll go with Titanic! This set is SO fantastic!!! Every detail is perfection! Goodness gracious, Jody! You have outdone yourself once again! Amazing set you have created! Wow! This gift set is awesome!!! (ya, I'm from the 80's! )LOL I love it, you did an awesome job with that kit!! My fave chick flicks, I've always loved Fried Green Tomatoes, Steel Magnolias, Pretty Woman, and The Proposal was good too! dang! I am so tempted but have NO extra $ - ugh!! I LOVE this set and your project is AMAZING - lol on your DH! You forgot Steel Magnolias - that's a great chick flick! Darling set, Jody! Love it! * The American President (Super awesome lines that I quote ALL the time). * When Harry Met Sally (sure it's an oldie... but OH so good). OK... my list is a mile long I think... :-) I'm a sappy, cry-for-commercials kind of girl too. I *love* the set--what a creative hubby!! I need to get a sakura pen! I had the same problem--but I only had CE and didn't want it to dry! My fave chick flick changes all the time! All time favorite? Pretty Woman! great projects, right down to the glass bowl. I'm not sure what my fav chick flicks are cause my brain freezes but a recent fav is "50 First Dates"
Totally fabulous set, Jody!!! I love it all!!! Great inspiration; I so love your work!! 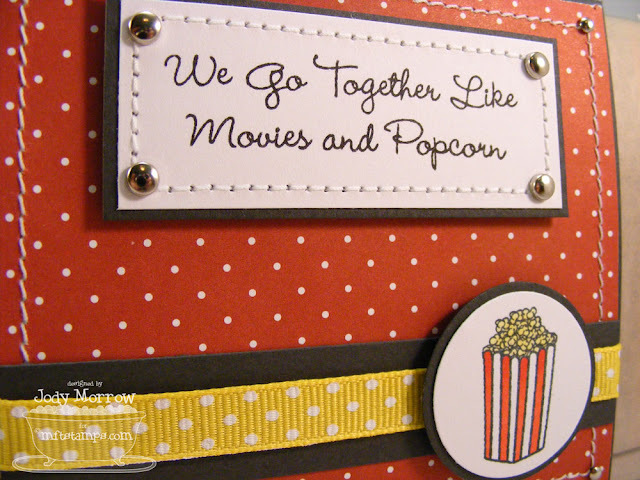 Movies - right now I am into any of the holiday movies - I DVR them and watch while I stamp and wrap. Wow...this is packed with fun fun FUN!!! I LOVE the glass bowl...SO cool!!!! Oh my goodness, this is the most amazing thing EVER it came out PERFECTLY and I just love it. This is SO YOU! My movie lovin friend!! What an incredible gift set Jody!! Love what you did with this!! My favorite chick flicks: Sweet Home Alabama, My Best Friend's Wedding, The Notebook...I could go on. TFS! This set is AWEsome, Jody! Makes me want to settle in to watch a good movie. 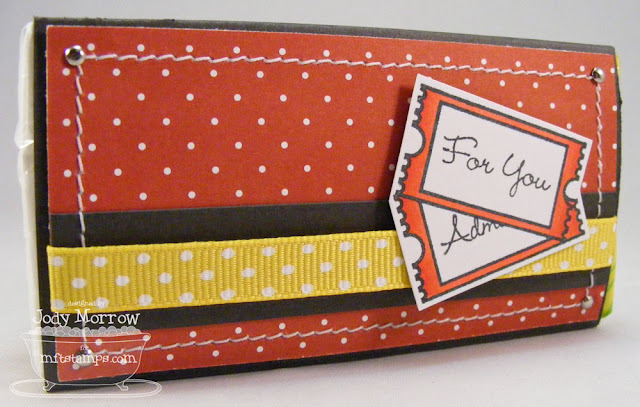 Love the layout & all the details--the shiny bowl & the treats inside. Pure CUTEness! That set is too sweet for words. P.S. had to think on the chickflick. Benny & Joon fo' shure! But for a really good cry, Sommersby. Love that Jody Foster! Awesome set, Jody! You ROCK!! What a great "gifty" set!!! :) FABULOUS!!! I have to laugh since I bought the popcorn holder last night, came to your site looking for a tutorial that you did last December- and see this... MADE ME LAUGH... I have only decorated the popcorn, haven't gotten to the candies yet, but I love your creations! As for movies: well I llove your list --- I think my 'order would be diffferent, but I would add Ugly Truth as well! Thank you- now I have to search for that tutorial! WOW, this is one very Beautiful & fun gift set!! I Love your blog & all your wonderful creations! "Love Affair" from 1994, which was a remake of "An Affair to Remember" from 1957. "An Affair to Remember" inspired "Sleepless in Seattle". Oh my gosh this is the cutest! Love the glossy on the popcorn bowl. Is Bridges of Madison County a chick flick? It must be cause I cry every single time and I'm sure I've seen it at least 6 times. here it is, whittled down to a respectable number: an affair to remember, an american president, the bucket list, daddy long legs, the family man, finding forester, grand canyon, the jane austen book club, just like heaven, the lake house, LA story, life as a house, meet joe black, notebook, sleepless in seattle, under the tuscan sun, the thomas crown affair (either version), while you were sleeping, the wedding date, and you've got mail. there's prob'ly more that my kid's borrowed that I can't recall now! can you tell I LOVE movies?! a couple close friends and I get together for chick flicks every 4-6 weeks or so. this is a GREAT stamp set - TFS! I love this set - so fabulous! Brilliant paper piecing too. Can't beat a good chick flick can you? !